Product #21508 | SKU AUDMINIWH | 0.0 (no ratings yet) Thanks for your rating! Share your music wherever you go with the slim Aud Mini™ from iLuv. Designed for maximum portability, the Aud Mini™ is the same size as the iPhone 5s and fits easily in your pocket. Although pocket-sized, the Aud Mini™ delivers big, full-range sound that will surprise and delight everyone. Pair your mobile device wirelessly via Bluetooth® and enjoy your music out loud. 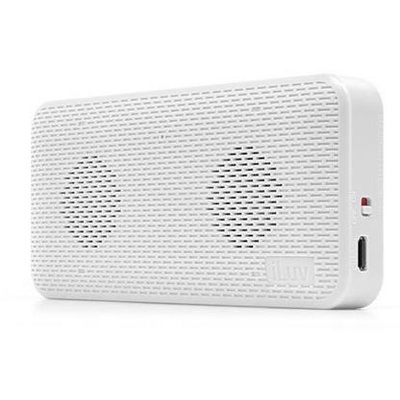 Slim, compact and lightweight, Aud Mini™ is as small as the iPhone 5s, making it the perfect speaker to bring along on vacations, parties and hangouts. Instead of lugging around heavy speakers or setting up complicated sound systems, just take Aud Mini™ out from your pocket and get the party started right away. Aud Mini™ is equipped with a robust speaker and passive radiator that allow you to fully experience music beyond the confines of your earphones. This little speaker delivers balanced, full-range audio so that every note in your favorite song sounds clear. Setting up Aud Mini™ is quick and easy. Just pair it to your smartphone or tablet via Bluetooth® and start playing music immediately. There’s no need for any wires, so you can change tracks and control the volume even if Aud Mini™ is across the room from you.